Did you think the screen on the LG G6 was a little too big? There may be an LG G6 Mini ready for release very soon. The rumored LG G6 Mini doesn't have a particularly small screen though at 5.4-inches (down from 5.7 on the LG G6) - it'll apparently be keeping the 18:9 aspect ratio from the LG G6 too. This rumor comes from a report by TechnoBuffalo, using information from a document the site can't publish online due to its "sensitive nature". 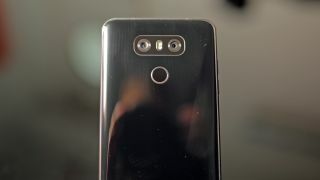 The rest of the specs for the LG G6 Mini are currently unclear, but we'd expect a Qualcomm Snapdragon 821 chipset, 4GB of RAM and a 13MP rear camera just like the LG G6. That's if it exists at all. The internal document from LG featured a reference to a date from early in 2016, which suggests it may be out of date and that the phone may no longer be in development. It may be that the G6 Mini was originally scheduled to be announced alongside the LG G6 in February, but the company may have decided against releasing it at the last moment.